It’s been a little over two years since Malaysia Airlines Flight 370 (MH 370) disappeared during a routine flight from Kuala Lumpur to Beijing. It is the greatest aviation mystery of our time, and we still have no answers about what happened onboard the Boeing 777-200ER carrying 239 people. Though MH370 is the biggest mystery to date, if we look back over the last century, there exist multiple aviation mysteries that still remain unsolved. For example, in March of 1956, three U.S. Air Force personnel disappeared over the Mediterranean Sea while flying a Boeing B-47 ‘Stratojet’ long-range bomber. The plane was traveling from the MacDill Air Force Base in Florida en route to the Ben Guerir Air Force Base in Morocco as part of a four-plane flight. While three planes showed up at their aerial refueling point, one went missing and no wreckage was ever found. The scary thing is—the plane was carrying two nuclear weapon cores that seemingly disappeared into the air, along with the plane and three people. Aviation mysteries are baffling and one cannot help but wonder: how is it possible for an airplane to just disappear? And secondly, why do such tragedies happen? In the case of MH370, there have been many speculations: maybe there was a terrorist attack, or one of the pilots decided to commit suicide, or maybe everyone is alive and the plane was landed on a remote island for some unknown purpose—and so the theories are ongoing. But the first question poses a different set of concerns: how is what happened to MH370 even possible in the 21st century? We live in a world where technology has already removed so many elements of mystery from our lives: before we had caller ID, we never knew who was calling until we answered the phone; before we had GPS in our cars, we used physical roadmaps to drive ourselves around; before we had the Internet, we couldn’t just Google any question or idea to find an answer. Yet, why hasn’t technology solved these mind-boggling mysteries of huge airplanes just disappearing into the airwaves? Now, if this were an X-Files episode, Agent Mulder might be the one to assume aliens are abducting planes that appear to vanish out of the air (which, by the way, there are some people who believe a UFO beamed MH370 right out of the sky) but we have to wonder what Agent Scully would think and how she’d go about solving the mysterious disappearance of an airplane. So is there a way for technology to solve these aviation mysteries? Moreover, how will we advance our technology so planes can no longer disappear into the airwaves? The unfortunate truth is that it is possible for an airplane to disappear. The technology does exist but, sadly, it’s not as easy to implement as we think it is. “Why,” you ask? The ocean. The standard practice for monitoring airspace is by using two radar systems: primary and secondary. Primary radar detects and measures an estimate of a plane’s position using reflected radio signals. Secondary radar relies on targets equipped with a transponder that asks for the plane’s identity and altitude. All commercial airlines have a transponder, which automatically sends a transmission with a unique four-digit code when it receives a radio signal sent by radar. This is the data sent to air traffic controllers, who monitor the airspace. Think of it this way: when you are flying across the United States, there is always someone watching because there is radar coverage over land. As a plane makes its way from say, New York City to Los Angeles, pilots check in about every 45 minutes to an hour because they are switched to the next air traffic controller. When traveling over the ocean, there is no radar coverage when you’re about 150 miles away from land because, well, oceans are incredibly vast and that’s why we have gaps in radar coverage. When flying overseas, pilots switch to a high frequency (HF) radio for long-range communication. Overseas, pilots are required to check in at fixed location points through what’s called “oceanic communications.” Or, depending on the airline, a plane might be equipped with a flight management computer (FMC) that will automatically make a transmission report with the plane’s speed, altitude and position. Pilots connect the autopilot to the route programmed in the FMC and the airplane will follow the programmed course and make check-ins at fixed location points. But you can very easily change the route by hitting the “heading select button,” meaning, if MH370 was equipped with an FMC, all someone had to do was turn it off and manually turn the plane 90 degrees, changing the route in a different direction. Though planes are equipped with GPS to track their location, it only lets the plane know where it is, not air traffic controllers, whose network is almost entirely radar-based. If a plane goes off course over the ocean, there isn’t a way for air traffic control to know its exact location. Some new, modern and expensive planes can utilize the black box on an aircraft (computerized equipment that records all of the planes data) and send back real time engine data to the company that operates it. Though black boxes are not currently equipped with any form of a GPS location transmitter, the capability is there, but it’s a very advanced, high-tech system. “The technology is there to track an airplane across the ocean, but it’s expensive and there wasn’t a need until now,” says Lon Lowe, captain at Alaska Airlines. It would cost the aviation industry billions of dollars to implement satellite technology, and Lowe explains part of the issue is deciding who pays for that. Reports indicate that, over the next decade, the aviation industry is looking to replace radar technology with a new system called ADS-B (Automatic Dependent Surveillance Broadcast) as the primary system for air traffic control. This would use GPS technology to send data to found controllers and other planes for tracking purposes. If you’ve ever used a flight-tracking website or app, this is information made available to the public and is how you’re able to track a flight from your phone. However, this would still not resolve the issue of tracking over water because the system’s coverage does not extend that far. However, the aviation industry is currently working to make sure a plane cannot disappear over the ocean again. Airlines and governments worldwide are coming together to determine how to improve flight tracking. In February 2015, the International Civil Aviation Organization (ICAO) met to start negotiating standards that governments will have to require for flight tracking with a goal of determining the rule by next year. But is human error or technology to blame? When it comes down to it, aviation accidents occur from multiple issues, but the majority of recent mysteries appear to most likely have been caused by the flight crew, a technological issue, or weather. Take, for example, the case of Helios Airways Flight 522, often referred to as the “ghost plane.” In August 2005, during a short route from Athens to Cyprus, the Greek aircraft lost contact with air traffic controllers and held its pattern around the airport for an hour, before fighter jets were scrambled to see what was going on. What they found was a rather grim sight: the pilot was slumped over the controls, oxygen masks were dangling and all 121 passengers appeared to be dead. It reads like an episode of the X-Files: Agent Mulder might have concluded aliens had overtaken the flight, whereas Agent Scully would have to agree with what officials determined as the cause: gradual cabin pressure loss. Though Helios Airways Flight 522 appears to have been resolved, one has to wonder how such an error, whether caused by a human or technical glitch, could happen. Lowe doesn’t think this situation was so much a technology issue as it was a human error. Another rather perplexing aviation mystery occurred in 1968 when Aer Lingus Flight 712 was traveling from Cork, Ireland to London. Not long after taking off, the plane crashed into the sea. Reports indicate the last communication with the plane was a call was made from the aircraft saying, “twelve thousand feet descending spinning rapidly” which prompted a search over the flight path. Despite a two-year investigation, authorities were never able to determine a cause for the crash, which killed 61 people. While some witnesses believe a British experimental missile shot down the plane (the British government was operating an experimental missile station in West Wales) but such reports have been denied and the crash remains a mystery. Sure—it’s still hard to stomach the idea of an airplane disappearing, or even enduring a fatal crash in this day an age. But, the future does hold some positivity as airlines look toward changing policies and investing in the necessary technology to improve taking flights over oceans. 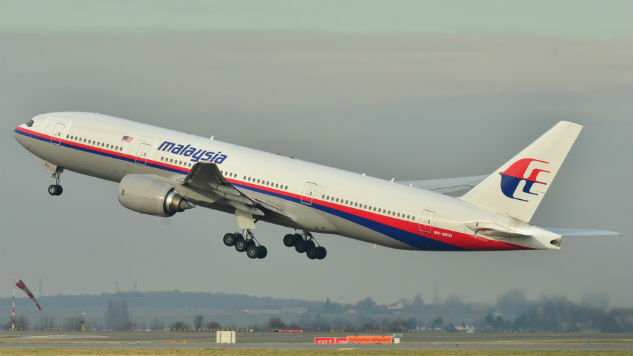 So while it is possible for an airliner to disappear, whether due to technical problems, human error, extreme weather or even by pure randomness, the hopeful outcome the aviation industry has learned from MH370 is that we should not see another tragic aviation mystery.